Jurgen Klopp hailed a “deserved three points” for Liverpool as their “convincing football” helped secure a 3-0 victory over Bournemouth on Saturday. 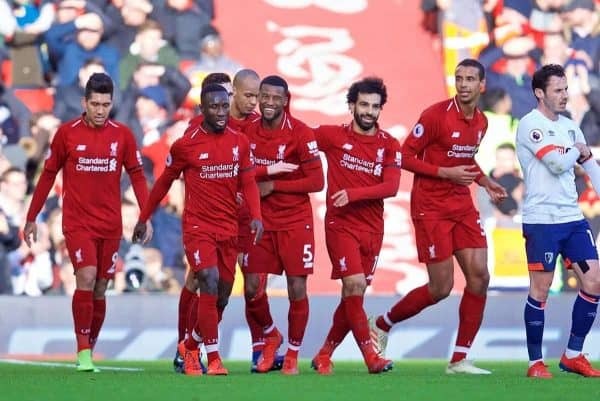 The Reds returned to Anfield after disappointing draws with Leicester and West Ham, and faced a Cherries side in mixed form of their own. 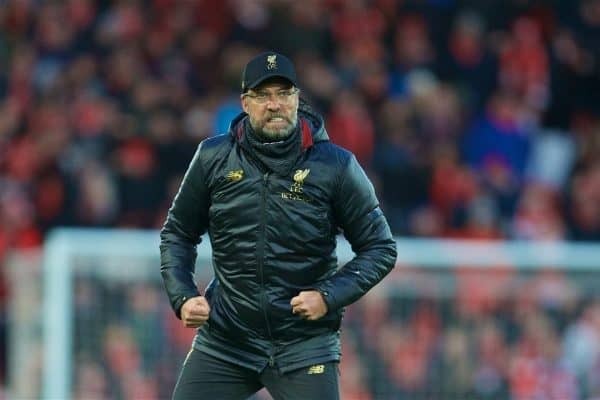 Despite Eddie Howe’s claim in post-match that he had “set up to frustrate” Liverpool, it proved the opposite as the hosts ran rampant, producing a fluid display on their way to a comfortable win. Sadio Mane opened the scoring from James Milner‘s cross, before Gini Wijnaldum doubled the lead with a brilliant lob over Artur Boruc, with Mohamed Salah finishing off a fine team move after the break to make it 3-0. Speaking to reporters at Anfield after the game, Klopp praised his players for “showing a reaction” to their recent setback. “All the goals were brilliant. It was just a really, really good game and a very deserved three points,” he explained. “We are very self-critical. It was clear we were not happy with the two performances [prior to Saturday]. There were always reasons for it, for us. “You cannot speak too much about it in public, because it sounds like we’re looking for excuses. “We are not, the analysis must be sensible, we have to talk about the right things with the boys and we did that. “We knew about our situation, and we knew that we were not happy with our performance in the last two or three games; still you can win a game, or draw it, for different reasons. “But we don’t want to come through ‘somehow’ in the game. We want to play convincing football, we want to perform. Klopp also revealed an illness for Wijnaldum in the buildup, praising his and Milner’s influence despite their recent issues, and the commitment Jordan Henderson and Trent Alexander-Arnold showed so soon after injury. Next up for Liverpool is a huge Champions League clash with Bayern Munich on February 19, but before then Klopp’s squad head to La Manga for a warm-weather training camp.